Creating a great culture is something you can immediately feel if you have got right! Customer Insight – Yeah right I talk to customers! So much of a service is intangible. Compared with a tangible product, a service can be much harder to differentiate from its competitors—and more difficult to ensure consistent and high-quality customer experiences. Strategic Service Design is a holistic way for you to show how empathic you are to your customer needs. It is a practical but creative way to improve your services and innovate new ones. Strategic Service Design is all about making that customer journey tangible. Humanising services is about creating those purposeful touch points that become those memorable moments for your ideal customer and position your brand head and shoulders over any alternative. It is based on the principal of don’t tell me, show me and emphasises the important of designing a customer journey that is alive, interactive and delivers every time. 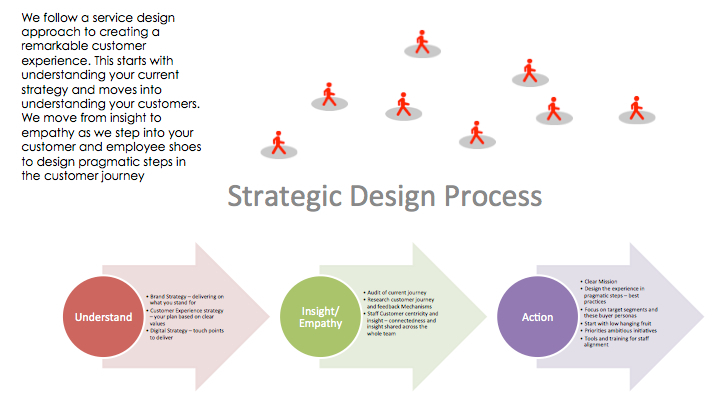 Strategic Service Design was created out of my interest in Service Design. Holistic – the entire environment of services should be considered. *Note: from This is Service Design Thinking book. Thus, Service Design is a philosophy or a way of thinking. I have taken this practice and created Strategic Service Design. It is based in innovating services to make them more useful, usable, desirable for us. It is a multidisciplinary integrated and holistic way to show empathy to the user. The reason I really resonate with this approach is, ultimately value is not just tied to the deliverable of a service but the ultimate value is tied to the how of the delivery as well. We are emotional beings and we make decisions based not just on a service ticking rational needs, but out emotional needs as well. This approach can provide great services and customer experiences. I love 31 Volts service design definition. It is this strategic service design approach that integrates so much with my customer centric marketing approach. Customer Centric Marketing includes the process of strategic Service Design. It has a few key steps. 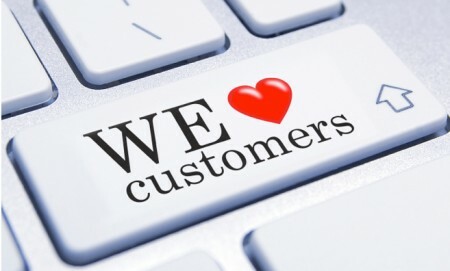 Customer Centric – this means every touch point or customer interaction with us. 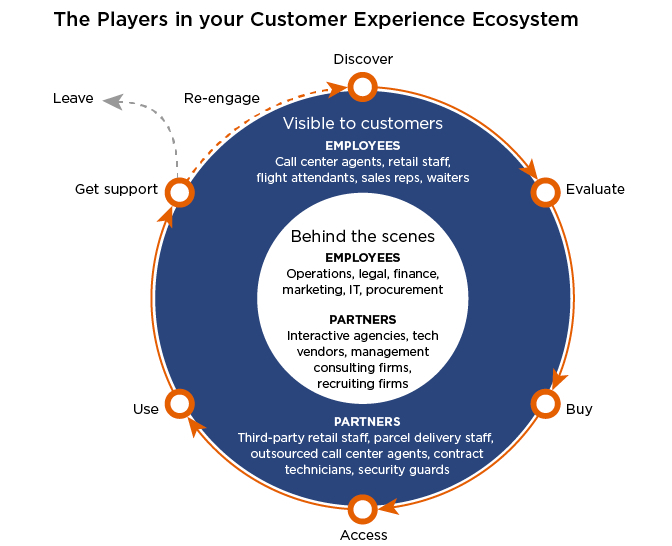 In a customer centric approach, the customer is at the center of the design of our process. This approach requires empathy for the customer when designing our interactions with our service. When we understand the mindset of the customer we can really deliver exceptional customer interactions with our brand. Employee Centric– the employee (especially with the social media mediums are now in a place to influence and interact with our customers). They can have a profound impact on the customer experience. Employee satisfaction, buying into a vision they can share and being empowered to live the values, makes all the difference to their engagement and the customer’s experience. The employee culture and shared values, ultimately is how the service is delivered. Motivating employees is part of this delivery. Purpose of the company is critical to this. Science shows and Dan Pink has contributed to this theory, that employees need autonomy, mastery and purpose to really feel motivated. Understanding of Value – my view of marketing is all about creating customer value. It is about creating relationships. It is about understanding what they value, their values, their problems, their practices so that we can deliver a truly valuable service experience. Purpose Lead – purpose lead organisations have a higher agenda than just creating profits. They have a contribution to make because of their skills, abilities and insights. Dan Pink calls this “transcendent purpose” makes coming to work better and attracts talent and makes the organization connected to something bigger than just day to day work as usual. Also it makes the company more admirable by it’s customers and is likely to be more productive and profitable. Whether it is a connection to sustainability, a charity, a delightful experience, all transcendent purpose driven companies wish to be a contribution to creating a better world. Finding this purpose is part our our approach. Marketing Role – I am often told that there isn’t many marketers that approach marketing in a truly customer centric way. I believe that is because it is hard to keep a customer lens. It is tempting to switch back into what’s in it for us. However great strategic insight and empathy I believe is needed to create a compelling value exchange in service based business, and to do this really well, a marketer needs to be part psychologist, part technologist, part strategist to name a few. We need to have an outside in approach first, not an inside out. This user centered design approach, is central to service design as an approach. To date very few, if any marketers have adopted this approach. Business Strategy –My approach to marketing a service is built in understand the service, the ideal customer for that service and how you compete in a given marketplace and what value do you create. This differentiation is integral to the business strategy and frankly can’t be separated. Strategic decisions that a company makes should be driven by the customer at the centre. Understanding who you are and what you stand for is so important. It is key for customers and employees. Getting this right and authentic is the backbone to creating a great brand. Technology Led – Customers today interact in a very different way than they did even 3 years ago. Technology is driving this change. It is changing the landscape for service based businesses. It is such an important consideration when building a marketing approach. The processes and touch points need to be driven by technology that the customers expect and more importantly have to be balanced with human interaction to create delightful experiences. Service experience or customer journey –The experience that service based businesses create along the customer journey is directly related to how well the brand essence has been internalised by staff and how creative management has been in living the journey through memorable touch points. To do this effectively their needs to be collaboration, insight and empowerment. It is an iterative process and should be evolving as customers change. Cutting edge companies are collaborating with customers, partners and some even competitors to improve this customer experience. This evaluation of the customer experience journey we do with you and it is done every year to build on best practices and the changing needs of your customers. Graphic Design – Interpreting the culture and value of a company is a symbolic in a way; typography, colour, form and composition. Design can create desirability because images can create as a strong emotional dimension as well as serving a functional benefit. To create strong desirability the designer also must have a customer centric approach. There has to be strong alignment in your offering, positioning and customer value. The way something looks, smells and feels can really be designed. It has such an important role to play in humanising your services. Creative Spaces – Internal Branding –The space we provide for our employees is so important in communicating our brand’s values. Often I have gone into a workplace where the MD states yes they are all for collaboration, but they have an office layout that doesn’t support it. Creative spaces, colour and mood is all created by the environment. Assessing this and how to communicate the brand is all part of our journey. Outside In is a great book that explains an awesome approach to starting your customer experience. We have taken this best practice and build a Customer Strategy Plan based on these six disciplines. Strategy – What is our customer experience. This is unique to your business and customer. Customer understanding – you need to understand your customers and what they are thinking and feeling We do this as part of our customer research. Measurement – you need to measure it to manage it. Perceptions, activity, intended behaviours. You need all three. We do this through a customer centric dashboard. Governance – you need rules and accountability so you can see where the problem lies and fix it. It is not finger pointing but team work. Culture – only if you hire the right people with the right attitude and values will a customer experience become your point of difference. It is in those little moments and interactions when the culture will ensure that consistently the customer comes first. Getting the right people on the bus is a reflection of your values being part of your hiring criteria. Mltcreative is a company that has a template called upclose and personna and it does just this!